We know we cannot and should not put all of our cash into the markets at any time.But that begs the question: How much should be invested? We arrive at this figure by taking our overall liquid investments (cash, stocks, bonds, mutual funds) and subtracting what we truly need to hold in cash. This amount includes our emergency fund (typically 6 months of expenses), plus any additional cash needs over the next 5 years. Setting aside all funds needed over the next 5 years allows us to sleep better when markets stumble, knowing that for at least the next 5 years, our life plans will be unaffected. Practically speaking, this means we must project both our income and expenses over the next 5 years in order to arrive at a net figure. People still in their working years will mostly have a positive figure. Those in retirement or transitioning to retirement are more likely to have a negative figure. If positive, we disregard it and simply hold our emergency fund outside the markets.If we expect to be negative cash flow, then we need to add this to our emergency fund and set it aside. The 5-year cut off is not an altogether scientific figure and comes from the fact a diversified portfolio of large stocks (in this case, the S&P 500) has only declined over a 5-year period about 1 in every 9 times over the last 70 years or so. 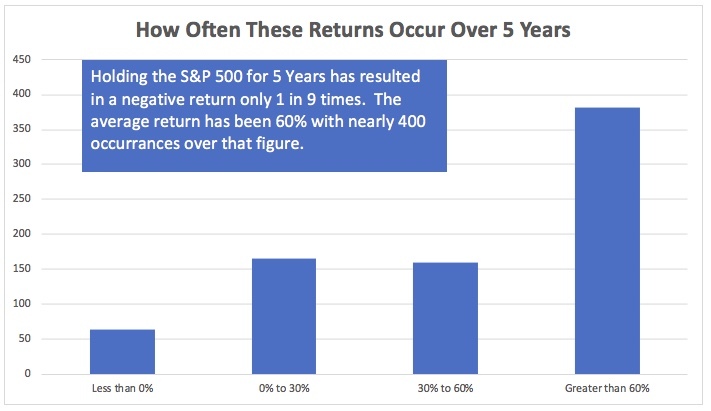 During that same time period, the average return over all 5-year periods is about +60%. So, if history is a guide (and it is only a guide), we might say that by ensuring we can stay in the markets for at least 5-years we are expecting to earn +60% in exchange for a 1 in 9 chance that we actually lose money. While those seem like very good odds, we can never say with certainty that future markets will behave like past markets. Heck, we can’t even say with certainty that the sun will rise tomorrow. But with this methodology, we might find a balance between earning higher returns and sleeping through the night. If you have any follow up questions, please reach me through the form below and I will personally respond to you!